fototazo: Photographers on Photographers: Endearing Yet Eerie: A Closer Look at Jamie Diamond’s "I Promise to Be a Good Mother"
Photographers on Photographers: Endearing Yet Eerie: A Closer Look at Jamie Diamond’s "I Promise to Be a Good Mother"
For more posts in the ongoing "Photographers on Photographers" series, please see the site links page. Generally speaking, when we look at photographs, we read their contents as truthful—when a lively, happy family is presented, all those undocumented moments of tension, gossip, and drama no longer exist. We preserve in the manner we wish things to be remembered. When we look at our friends' Facebook pages and grow jealous of their happy relationships, successes, and flourishing social-lives, we forget that photography is highly curatorial in nature. I enjoy Diamond's recognition of this and her desire to question experience by presenting the most unquestionable of circumstances. 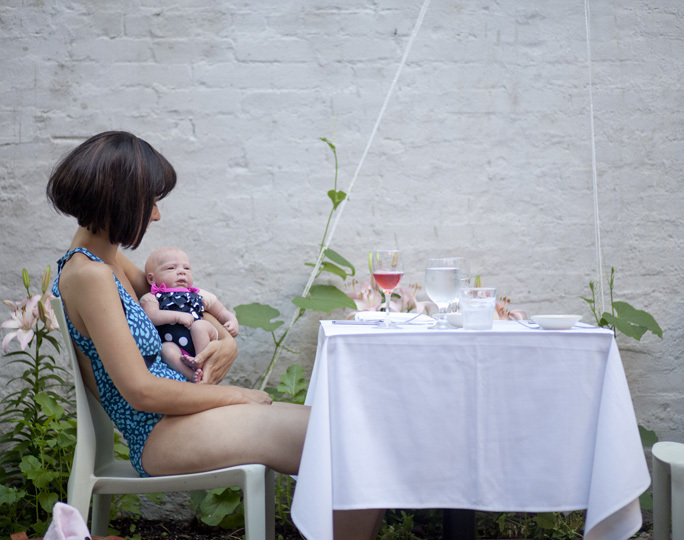 It is for this reason I became enthralled not just with Constructed Family Portraits, but another, more intimate series of hers titled, I Promise to Be a Good Mother. At first glance, I Promise to Be a Good Mother appears to be a tribute to the sacred bond between mother and child; however, seeing it as such denies it of all the criticality and nuance it possesses. I Promise to Be a Good Mother is not so much a manifesto, but an analysis. The series name comes from a diary the artist kept as a little girl2. The photographs, which feature Diamond posing alongside a baby doll, carry modern-day Untitled Film Stills vibes with their quiet cinematic compositions and lack of supporting characters. A combination of endearing and eerie, these images do not carry a clear narrative. Instead, each represents its own experience. In one photograph Diamond, the "mother" lounges seductively in bed, cigarette in hand, while baby Annabelle (yes, she has a name) is tossed aside; lifeless. The remains of brunch create a fault line between the figures. Other moments are heart-warming; beach outings, trips to the park, a game of pat-a-cake. But when Diamond is not channeling the appearance of a hands-off mother, or a doting one, she is climbing transmission towers, dashing up stairs, and walking along the middle of a near-empty road, child in hand. Is her dedication admirable, or just crazy? Is she protective, or dangerous? To continue down this path, it is worth noting Annabelle looks, well, dead in a few scenes, adding to what can be considered a heartwarmingly macabre storyline (anyone familiar with the music video to Modest Mouse's "Little Motel?"). What I love most about the project is the skepticism it displays toward all those innately maternal characteristics women are assumed to be born with. Diamond "[mimics] and [ignores] the traditional visual signifiers of motherhood" in a wonderfully straightforward manner3. Her photographic style gives viewers the impression they are not looking at an album of family photos, but voyeuristic glimpses into the life of a young woman. The scenes themselves are presented clearly for all to see, yet the ambiguous narration leaves us with more questions than answers: Are these images of a single mother? Or is her significant other simply not interested, not obligated the way she is to look after this baby? I myself have never experienced the desire to have kids—of course, I am only twenty one, but do not imagine this changing any time soon. Growing up, I used to become upset while watching movies, when the lead female character would express the desire to have a baby—I never understood what was so joyous about children, or babies, how they have the supposed potential to enrich lives. I still struggle to understand this. Television always made it seem children were a need all women would inevitably possess, but I realize now if you want them, that' fine, and if you don't, that's equally fine. I am lucky to have a wonderful mother, who loves and supports me unconditionally, but I have never imagined myself caring for someone the way she does for me— in fact, I struggle to do a decent job comforting my own twin sister. I Promise to Be a Good Mother is powerful because it shows a woman fumbling to care for her child, and for every fumbling moment, there is a sweet one, but even those moments feel strange and foreboding. We do not always fit, like perfect puzzle pieces into the roles expected of us, but there's nothing wrong with that. Roles are social constructs, and this notion is only revealed when things do not line up. There is an element of performance in the everyday, and this is what Diamond reveals through her work.